How do normal kidneys function? What goes wrong? What are testing and treatment options? A couple of months ago, I noticed that my 15-year-old cat, Thomas, was drinking an awful lot of water. 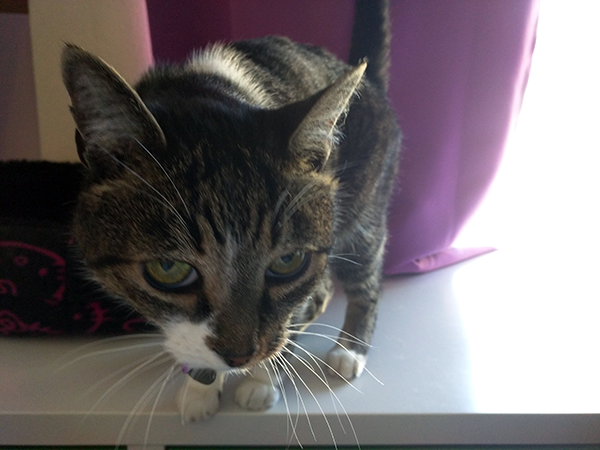 I know that a number of conditions can cause excessive thirst in cats, so I didn’t hesitate to take him to the vet about a month before his scheduled senior semiannual exam to see what was going on. The vet did an exam and drew some blood. When she called me a couple of days later with his blood test results, I was not terribly surprised to find out that he has chronic kidney disease. According to the Cornell Feline Health Center, at least 30 percent of cats will develop kidney disease at some point in their lives, and more than half of cats age 15 and older have the condition. So here’s the lowdown on feline chronic kidney disease. 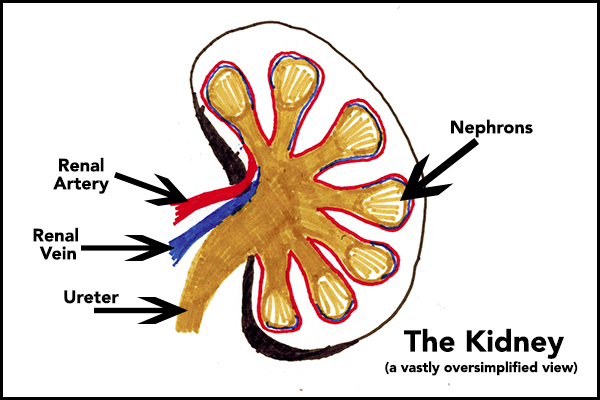 Let’s start with a quick explanation of how the kidneys work, aided by my vastly oversimplified illustration. First, blood containing waste products enters the kidneys through the renal artery. From there, the blood vessels get smaller and smaller until they wrap around tiny filters called nephrons. Each kidney has hundreds of thousands of nephrons, and each nephron contains a microscopic structure that filters waste products out of the blood, along with some water. The waste product-laden water drains through tiny tubules into the ureter, which transports that liquid to the bladder, from which it is excreted as urine. The filtered blood, minus a little water, exits the kidneys through the renal vein and goes back to the heart and lungs for another trip around the body. Essentially, the nephrons get less and less efficient at removing wastes from the blood. However, they’re still really good at removing water, which leaves the cat’s body in a state of dehydration with higher toxin loads in the blood. The cat compensates for this by drinking more and more water, which is the body’s instinctive mechanism for dealing with thirst and an overload of waste products in the blood. Drinking more water causes the cat to urinate more, which causes him to be even thirstier. The excessive drinking and urination does help remove some of the extra waste products from the blood, but the kidneys are still not working very well. Thus, a change occurs in the balance of waste, minerals, and electrolytes (sodium and potassium, primarily), and the cat starts feeling pretty crummy. One of the primary symptoms you might notice at this stage is nausea, which usually manifests in the form of lack of appetite. 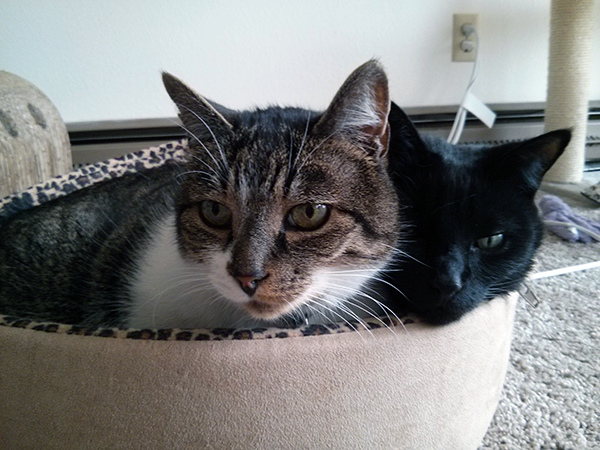 Thomas with his snuggle buddy, Belladonna. If you bring your cat to the vet with symptoms such as excessive drinking and urination, your vet will want to do some blood work and take a urine sample. The blood test is designed to measure the concentration of certain chemicals and compounds in the blood. Waste products such as creatinine, which is usually excreted in the urine, show up in the blood, which shows that the kidneys aren’t working well. It will also show if there are low levels of chemicals such as potassium. The urine sample will allow your vet to determine how advanced the kidney disease is. If the urine is very dilute (lots of water, few waste products), that says the kidneys aren’t working efficiently. If there is protein in the urine, this is another symptom indicating kidney disease. Until recently, blood work wouldn’t reveal kidney disease until only about a quarter of a cat’s kidney function remained intact. A new test, the SDMA, can detect kidney disease an average of nine months earlier than standard blood work, thereby allowing treatment to begin earlier and slow the progression of the disease. Chronic kidney disease is not curable, but it is manageable. Veterinarians also try to treat complications of kidney disease such as high blood pressure and leakage of protein into the urine. Vets might also prescribe anti-nausea medication for cats who aren’t eating because they’re feeling ill. Some vets will recommend dietary changes, suggesting that cats with kidney disease eat a lower protein diet, especially if protein is leaking into the urine. These foods may also have special vitamin supplements to help the kidneys stay as sound as possible. In later stages of the disease, when the cat can no longer drink enough water to compensate for the lack of kidney function, subcutaneous (also called “sub-Q”) fluids are prescribed. This procedure can be done at home, and it’s easy to learn how to do it. Your vet will be happy to teach you how to administer sub-Q fluids, and of course, vets can administer the fluids themselves if you can’t do it. 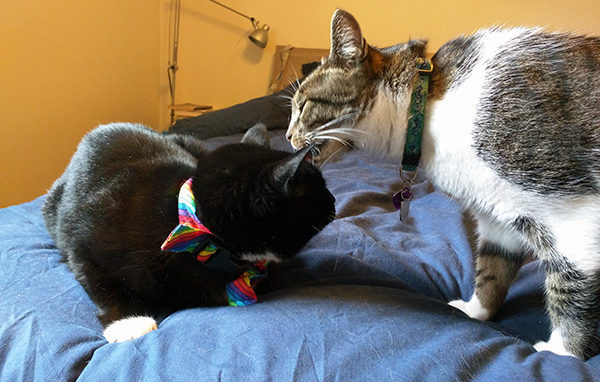 Thomas and my “surprise kitty,” Tara. Depending on the stage your cat’s kidney disease, you could have anywhere from months to a few years left with your kitty. I suspect I might have about two more years with my Thomas before his kidney disease gets too severe to manage, but who knows? 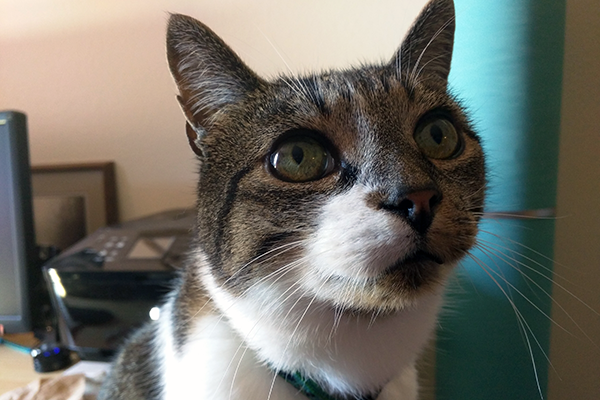 If your cat has chronic kidney disease, there is a wonderful website called Tanya’s Comprehensive Guide to Chronic Kidney Disease. If you’re feeling overwhelmed with your cat’s diagnosis, if you want tips for giving sub-Q fluids, or you just want to learn more than I can tell you in this post, it’s a great adjunct to any information and assistance you get from your vet. 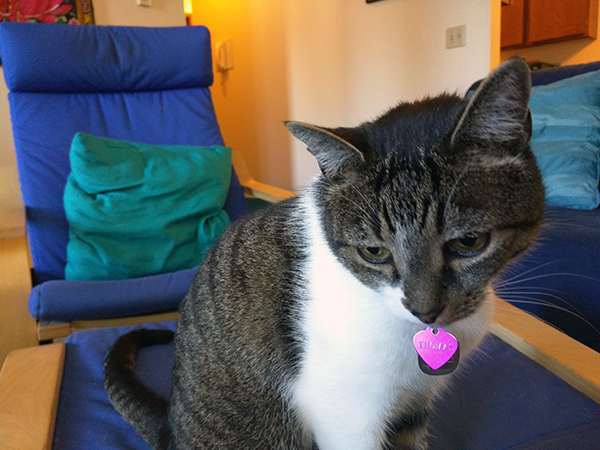 Do you have a cat with chronic kidney disease? Please share your thoughts and tips in the comments for people (like me) who are newer to dealing with feline kidney disease.